Scott Ford is the blind guy that just keeps going. 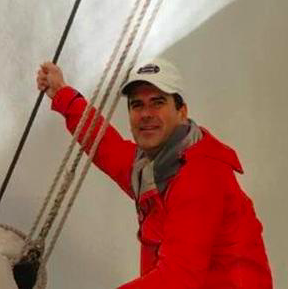 While he was at the Tallship Conference earlier this year, he met Joseph Lengieza, Billy Sabatini, David Goldman and Chris Cusson with the Flagship Niagara. After speaking with them they invited him to sail on the ship. They agreed that if everyone felt that it was a good fit then Scott would be invited back to sail aboard during the voyages later this summer. The staff of Niagara are very interested in developing a program for individuals who have visual impairments or other disabilities. Having Scott aboard provided them an opportunity to figure out how to develop policies and practices to allow people with disabilities to get the most out of such an experience as well as do it in a safe and fun environment.